Twisted Sister: Autumn is for Birds Blog Hop! Autumn is for Birds Blog Hop! My newest fabric line with Hoffman Fabrics "Autumn is for Birds" will be in stores in April. I asked some friends if they wanted to help launch the line by participating in a Blog Hop. 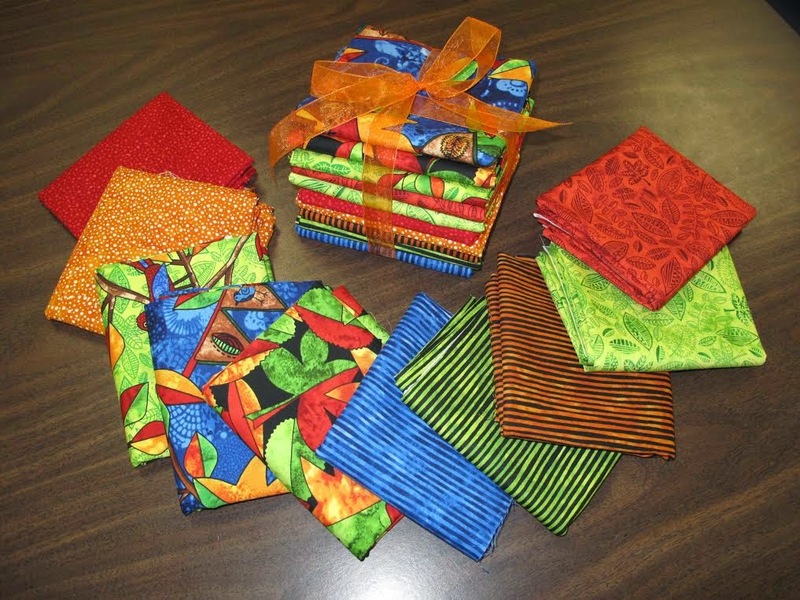 Each artist was given a bundle of the fabrics to create an art quilt or anything that they wanted, using the fabrics in some creative way in their own style. I am excited to see what everyone created! It starts Monday, February 16th! These are the fabrics in the collection. Focus fabric is a collage of elements made by me, using Hoffman Fabrics hand-dyed collection of fabric in the colors that I hand picked. A couple of Batiks with dots, three stripes, and a hand drawn leaf in green in red. The green leaf is also the background for birds in branches. Large and small leaves on a black background. Bird Blog Hop - Bundle Give-Away! Super excited about this! This only applies to residents in the US. If you want a chance to win the bundle, leave a comment on everyone's blog on the HOP. Deadline is February 25th at Midnight PST. All comments will go into the Random Number Generator, and the winner will be announced on February 26th. Hoffman Fabrics will be sending out the bundle. Here we GO! This will be fun, love the fabric and it will be fun to see what the different artists make with it. This fabric is delightful! I can't wait to see what everyone makes with it. Thanks for the fun! I can't wait to see what all the designers create out of the bundle. Gorgeous new collection Jamie. I'm looking forward to your blog hop too. BTW - I shared your giveaway on the page of my blog where I share insights on contests & giveaways: http://quiltshopgal.com/giveaways-and-contests/ And I'll try to help increase of your fun blog hop. I really enjoy what you've created in this group. Love the colors, and just feel happy when I look at them. Beautiful fabrics. Would love to win to make bags and quilts for charity. Love the colors. Such fun! I love how you are so fearless with color -- your fabrics are a blast. Great quilt and fab collection! These fabrics are bold and exciting! Thanks for the opportunity to win. They would make an awesome wall hanging! Love the fabric. It would make a lovely family tree wallhanging.